And for the record it’s not like I’m all lathered up over this, it’s a game and basically recreational time with the fellas on sunday. No one’s twisted my arm for 16 years to renew. And I will still go to at least 2, and I’d wager the guys that re-up in my group will toss me a freebie here and there, most of them can’t make all 8 anyways. But my home-game streak ended last year at 103 consecutive, almost 15 years to the day without missing a home game in person. Let me just say, it was pretty satisfying to be on the couch for a couple of those meaningless december games. I just renewed. Rockpile seats went up $4 and high upper decks went up $2. See you in September! it may have changed the last decade. this was a slap in the face because an attempt to sell a real game ticket showed it was worth "only" $80 to a snarky purchaser. I can tell you as a season ticket holder, I would rather just have the total price of the season ticket divided by eight. In other words, if my seat cost $800 for the year, I would rather each regular season game carry a face of $100 x8, rather than $80x10. ( changes for the variable pricing employed now, i know, this is just illustrative). I don't know why they don't do that, it is not like anyone thinks the preseason game have any value what so ever. If i was marketing the NFL, i would sell the point that if you get seasons, we give you the added bonus of two free preseason games that nonseason ticket holders have to pay for. Also, face goes so up, so maybe in a market with plenty of secondaries always avaiable, average price on resale to regular season games also creeps up some...another bonus to season ticket holders. It’s not so much the $, I’m a “money’s already spent” kinda guy. It does chap me a bit to see tix go for pennies on the dollar on the street, but that’s not the break point. The cheap tix are good for people that normally wouldn’t be able to afford a game, and I think everyone in the area should be able to enjoy the experience from time to time, regardless of how good/bad the team is. BUT, those sub $20 tix definitely draw a certain crowd. The one game/last game I went to for the season was a disaster film inside the stadium. People falling down the aisles, some fights, dude whipped it out and pissed all over the section like 2 rows in front of us, friend of mine got puked on. It’s an embarrassment sometimes. These types are in the minority, but certainly cause the biggest ruckus, and it’s accentuated when the game is meaningless and the stands are only 2/3 full. Agreed whole heartily there. I think one of the reasons fan behavior seems to have improved the last 5-6 years is the fact the team was far more competitive compared to years prior. But I would def agree that the crowd certainly changes if it is the cheaper "$20 to sit anywhere games" and you get many more people there to drink and party with no regard for the game or people around them. I’m not sure but I’d guess it has something to do with the CBA. We always charged full price for the preseason because it was extra revenue. The reality is that people get all pissy when they pay full price for the preseason. 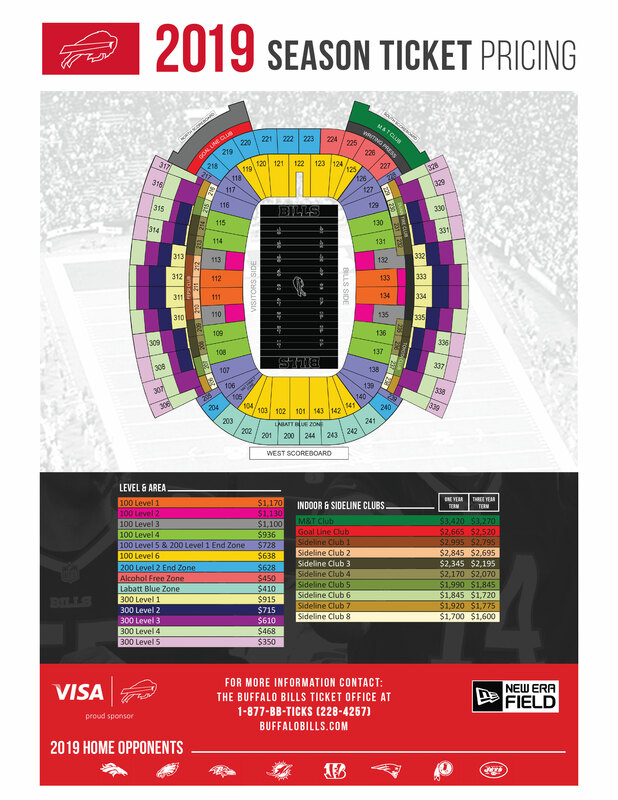 The reality is, if your preseason games were less your regular season pricing would be higher. There are revenue targets that every team is going to achieve. The pricing on the tickets is merely a placeholder. Your example is basically what would happen. If it is $80 * 10 games or $100 * 8 it ends up at the same place. You can re-sell through the One Buffalo/Ticketmaster app. And now you can do it for less than face value. Used to be I could not go below a certain value on Ticketmaster. You could on Stub Hub though, this was when we still could get paper/print at home tickets. A train leaves Rochester headed west at 60 m.p.h. at 7:00 am. It arrives at Dunkirk Don’s new and undisclosed stadium site at what time? Just pulled the trigger....Here's praying for a 2019 season Home Playoff Game Baby!!!!! I would renew first, and then check out the relocation process in April. Its really easy to find a new place to sit. Interactive seating chart and all. The relocations are on an interactive seating system? That's cool, does it run smoothly? Yes, I usually look around just for fun. Highly recommend, if you have any interest in relocating. It made it super easy a few years ago, when I wanted to relocate next to some other friends of mine. Sounds about same- at least they have figured out stopping resales hurts sales overall. I love being a season ticket holder but I don't know if the crew I share the account with is still on board. It's not a tough ticket and the economic argument to keep the account get harder when you can't give away the late season games. TBN has an article on ticket prices. Outside paywall.